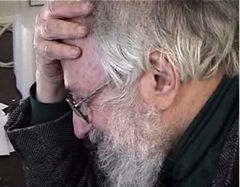 The following excerpt of Seymour Papert speaking comes from a videodisc produced by the MIT Media Lab circa 1986-87. Seymour Papert: This is an attempt to make a sketch of what a school of the future might be like. Now, nobody really knows what the future will be like, but we know what it won’t be like. We know it won’t be lots of children sitting in desks with pencil and paper, writing all the day. We know that these new technologies, these computers will be an important part of it. If you go into any school or any home, you’ll find many pencils, many crayons, many paintbrushes. These are instruments that people have made part of their lives. They use the pencil whenever they have a need for it to draw, to write a story, to calculate, and so with the computer. It’s the natural instrument for doing mathematics, for music, for a hundred other things. Our goal here is to make it sufficiently part of the culture of the place, that everybody uses it when it’s needed. There are many aspects to what goes on in the school. We see children here writing stories. In other parts of the school, we see music. We see very special products like LEGO/Logo. This might sound like playing with toys, but that’s just what’s so clever about it. They are playing with toys in a very sophisticated way. The LEGO/Logo project is one in which children build with the construction set LEGO, and then interface their constructions with computers so that they can control them. The children are learning to program. They’re learning important ideas about motion, about feedback. They’re learning principles of engineering, design. Above all, they’re learning that knowledge is a unified thing and that the scientific and formal and mathematical knowledge is not something separate from their passion from toys, from the things they did since they were small children before they even came to school.